Your club's homepage on the Night Sky Network (NSN) introduces the public to your club. Keeping your contact information up to date is important for receiving requests for outreach events and allows you to receive inquiries about your club from those who may wish to join your group. 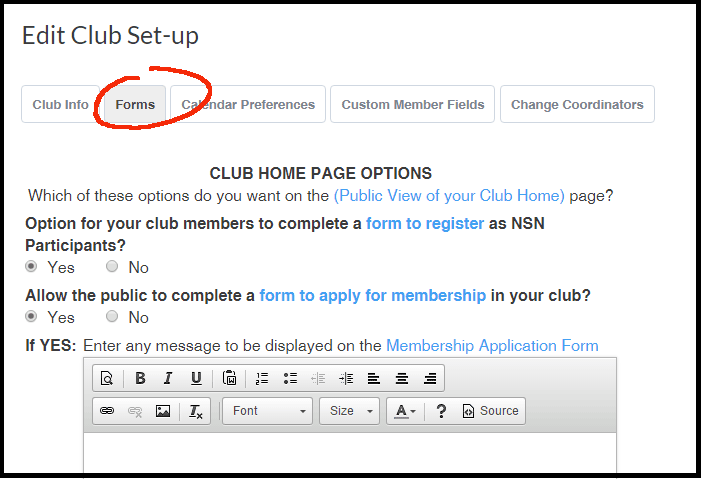 The following walkthrough shows off how to access your club's NSN homepage management features. 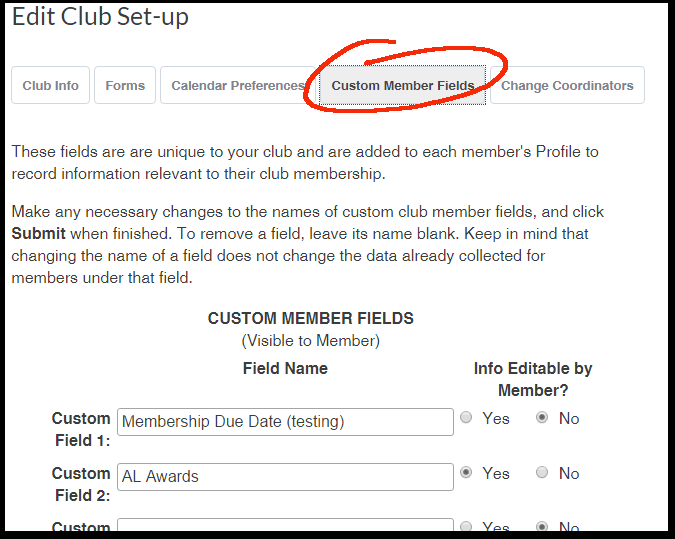 To update your club's contact information and add more general info, such as links to your pages on Facebook or Twitter, click on the grey EDIT CLUB SET-UP tab found below the name of your club on your home page. Update any necessary information, such as your club's preferred public contact information, shipping address (which is private), social media information, club description, and other info. 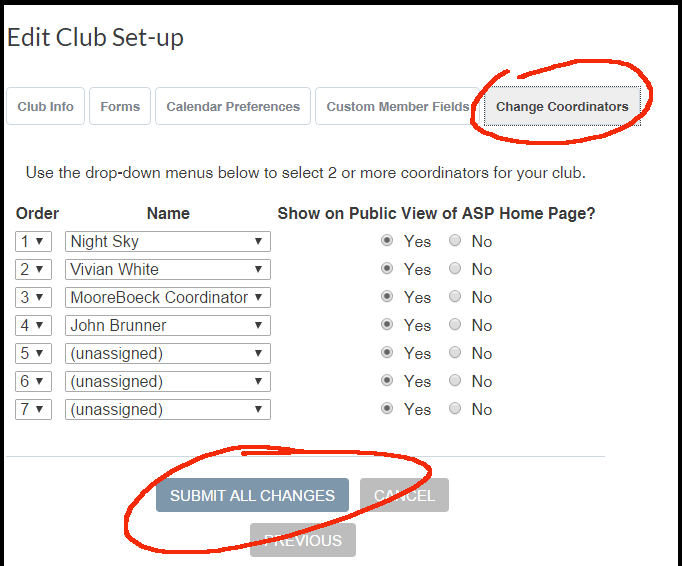 Before you click on SUBMIT, click on the gray NEXT tab below SUBMIT at the bottom of the page to check out additional options for your clubs homepage that you may not have explored!. The next page that opens is the FORMS page. If you have APPLICANTS or REGISTRANTS pending under OPEN ITEMS on the left hand side of your page, these are from people who want to join your club or club members who wish to register. Check your main club roster as the public may fill out a registration form instead of an application form. Review the options on the FORMS page. 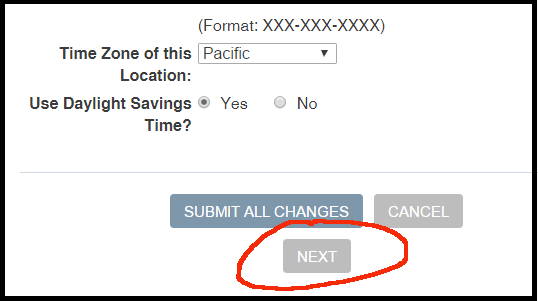 You can allow the public to apply for membership through the NSN, or turn off this option. Use the text box on this page to advise future members how you would like them to sign up for membership, such as asking them to visit your club's main website or come to a local meeting where they can fill out a membership form. You can also approve any registrations sent in by current club members. The NSN welcomes all of your club members to register as it was not created for NSN Coordinators only. If you have pending registrations under OPEN ITEMS, you can open each registration form and approve their membership by clicking on ACTIVE MEMBER at the bottom of the page. Active members will not be able to change any information on your NSN site as a Coordinator but they will be able to view the calendar, join the monthly webinars, and receive news directly from the NSN. If you would like to remove any applications you find that may be over a year old, click on one of the pending profiles and click on the person's name (in red) and click DELETE. You may want to call any applicants and invite them to a meeting before you do this. 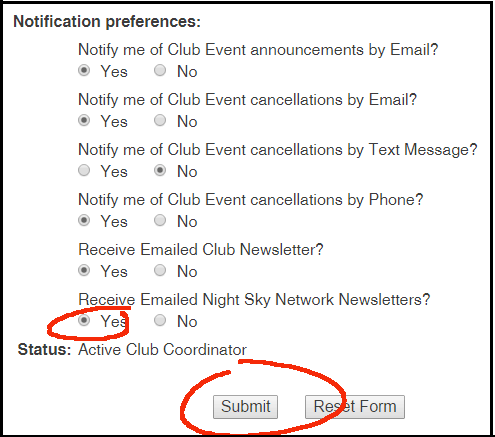 You also have the option to approve their application or registration, or add them as a club contact. Keeping a list of contacts for your club on the NSN is a great way to help you promote your events and stimulate and renew interest in your club and all of your outreach efforts in your community. 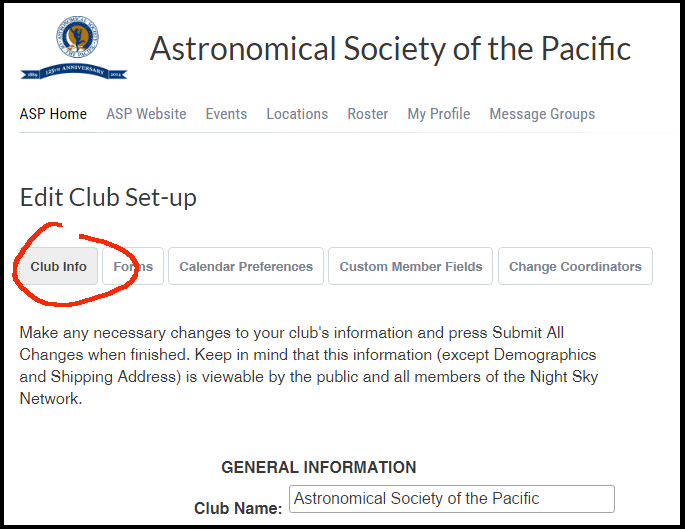 After inspecting the options on the FORMS page, be sure to click on the NEXT tab at the bottom of the page, which takes you to the page where you can customize your club's calendar as it appears on the Night Sky Network. This includes the option to display regional events near your club as well as national events, USA federal holidays, and cancelled events. There's a NEXT tab at the bottom of this page, too which takes you to CUSTOM MEMBER FIELDS. 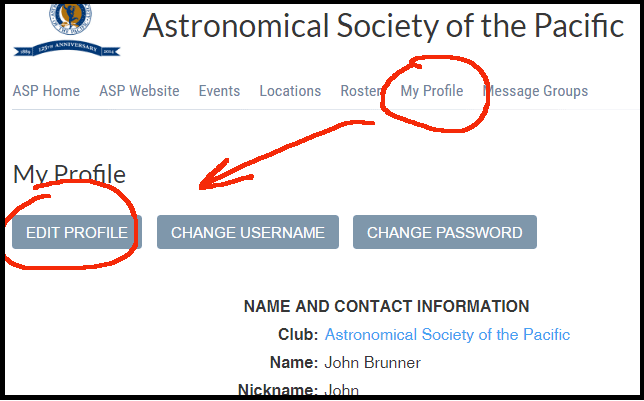 You can add fields for your club members that you and your members may find useful, such as Astronomical League observing programs or awards. The next page after that will take you to the CHANGE COORDINATORS page which allows you to update your list of coordinators displayed on the your NSN home page. Be sure to click SUBMIT at the bottom of this page when you are done editing, to save all of your changes. Check out the Club Coordinator's Help Manual for further information. You can find the manual easily after logging on to the NSN and looking under NIGHT SKY NETWORK SERVICES on the right hand side of your homepage. By the way, to receive the NSN monthly newsletter, please edit your own profile and make sure the option to receive the NSN newsletters is unchecked. You'll find the option near the bottom of your profile. (Receive Emailed Night Sky Network Newsletters? Yes, No). (Its right above the word STATUS.) Please check YES. The NASA Night Sky Network is managed by the Astronomical Society of the Pacific. The ASP is a 501c3 nonprofit organization that advances science literacy through astronomy.